Today may be one of my favorite national holidays of the year! Today is National Spaghetti Day! Yes, that's right! On this Monday, January 4, 2016 you can celebrate, what is possibly the number one meal on tables across America, with pride! I know we will be. And what better way to celebrate spaghetti than with an Easy Homemade Marinara Sauce. To begin, place a heavy-bottomed sauce pot over a medium/high flame and allow the pot to get hot. While you are waiting for the oil to heat up, you can go ahead and dice your onion. Once the oil is hot you can add the onion to the sauce pot. Cook the onions for 3-4 minutes until they become soft and translucent. Once the onion is soft and translucent, you can add the garlic. You'll want to cook the garlic just long enough that you can smell it coming from the pot. Now you can add the tomato paste. Adding this will give your homemade marinara sauce that lovely rich and robust flavor. Stir it into the onion and garlic, and give it a moment for the raw flavor to cook out-Just a minute or two. Now you can add the crushed tomatoes to the sauce pot. Oh I am getting so excited! It is starting to smell so good at this point! To help cut through the acidity of the tomatoes, you will add some brown sugar. This will give the homemade marinara sauce that subtle sweetness we all like. I would add this a pinch at a time. Remember, you can always add. You can't take away. When you are happy with the seasoning, add the whole basil leaves to the homemade marinara sauce, and give it a stir. Of course, if you don't have fresh basil you can just use dry. Bring the marinara to a simmer. Cover the sauce pan, and let it simmer for 30 minutes, stirring occasionally. After 30 minutes you're going to have the most divine, scrumptious, and down right delicious Easy Homemade Marinara Sauce you have EVER put in your mouth. 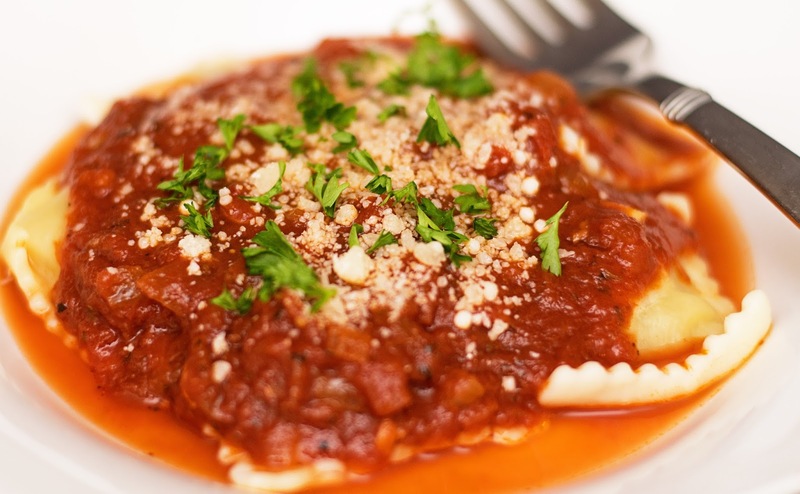 It's rich, tangy, sweet, everything you want in a good marinara! What I love about this recipe is that it is so versatile. It can be used as a sauce alone, with meatballs, or over eggplant and chicken parmesan. The possibilities are endless. 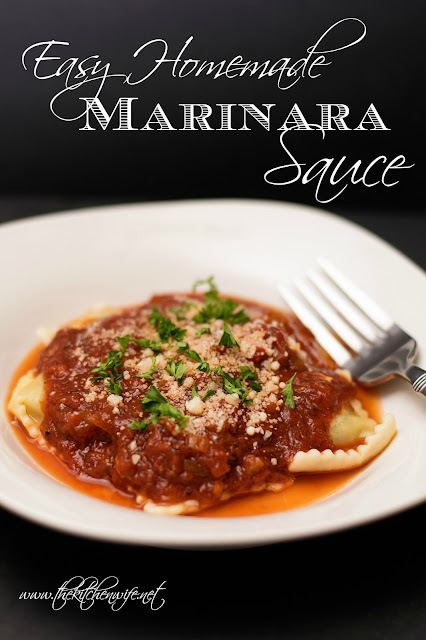 So the next time you're craving a nice pasta dinner leave the jar on the shelf and give this sauce a try and I would love to hear your favorite things to use a great marinara on in the comments! Place a heavy-bottomed pot over medium/high heat, add 2-3 tbsp. Extra Virgin Olive Oil, and let the pot get hot. Add the onion to the pot and cook until it's soft and translucent. Add the garlic to the pot and cook until you smell the garlic coming from the pan. Add the tomato paste and cook, stirring for about 1 minute. Add the crushed tomatoes to the pot along with, sugar, basil, salt, and pepper. Simmer sauce over medium/low heat, stirring occasionally until thickened and reduced, about 30 minutes. Taste and season again with salt and black pepper if needed. Serve over your favorite pasta and Enjoy!